Every applicant, with the exception of individuals applying for Folk Arts Apprenticeship grants, is required to apply through the eGrant system. A PDF copy of The Folk Arts Apprenticeship application may be downloaded from the Council’s website. To Access eGrant, click the following link below. eGrant will open in a new window or tab. Before preparing an application, thoroughly review the Guidelines including the Eligibility requirements to make sure your organization is eligible to apply in a specific grant category. The Guidelines outline eligibility requirements, program objectives and evaluation criteria. We recommend you review the narrative questions on page 8. Check your browser compatibility. eGrant.net works with Internet Explorer, Firefox, Safari or Chrome. We recommend using the latest version of these browsers. Click on the icons to install an alternative browser. Be prepared to complete the online eGrant application and submit the required supplementary materials by the deadline (Deadline Information). You are strongly encouraged to submit your electronic application no later than 4:45 p.m. on the application deadline date. The system will close promptly at 5 p.m. and late applications will not be accepted. Access the eGrant system by clicking on the eGRANT link. If this is your first time using ASCA’s eGrant system, you will be asked to create a login name and password when you first visit the site. On the ASCA eGrant home page, select “Click here to register” and create a login name and password for your organization. If you are creating an account for an organization, please place the organization name in the name field; not that of an individual. If you are registering as an individual, applying for a Fellowship or Technical Assistance, you should place your name in the name field. Once you have registered, your information remains in the system for future applications - DO NOT REGISTER MORE THAN ONCE! Multiple registrations cause duplications in the system and may keep you from receiving notifications concerning your grant. If you wish to make changes to your account name and password, or if you have forgotten your log in information, please contact Elliot Knight at elliot.knight@arts.alabama.gov or 334/242-4076, ext. 227. We can provide you with that information. Once you have logged into e-Grant, the first thing you will see is a description of the action buttons that you will be using as you create your applications. These buttons are not interactive until you find them next to a listed application. The first thing you should do after reading these descriptions is to scroll down to Create a New Application. Each time you create an application, the application will appear in the list with the Fiscal Year and Application Name. To the right you will find the Application ID number, the due date and time for that particular application, the status of the application and the action buttons described earlier. If you find you have created an incorrect application or more applications than you need, you may use the red delete action button next to the listed application. Be careful not to delete an active application. Click the navigation tree on the left side of the screen. To start the application process, click one of the available applications under “Opportunities” on the left side of the screen. You can then begin completing your application, using the save icons at the top and bottom of your screen to save your progress. At any time you can click the Home Icon to navigate to the Drafts section of the Main Menu. Here you will see applications not yet submitted. Select an application by marking the checkbox for that record. When the record is selected, the action icons along the top will become available. You can also navigate to the History section of the Main Menu. Here you will see a listing of all applications you have submitted. Please note: You will need Adobe Reader to print or view your application. Click the image to download free Adobe Reader software. CHECK YOUR USER INFORMATION NOW! Be sure your email address is correct so that you will receive submission confirmations and eGrant.net notices. Click your organization name at the top right of the screen to verify your information. SAVE OFTEN! eGrant.net will time out after 90 minutes if no activity occurs. When completing your application, click the Save icon to save your data. Clicking the arrows next to the Save icon will save your data and move you to the previous or next page. If you use the page titles on the left side of your screen to move between portions of your application, you must click the Save icon before moving to another page. 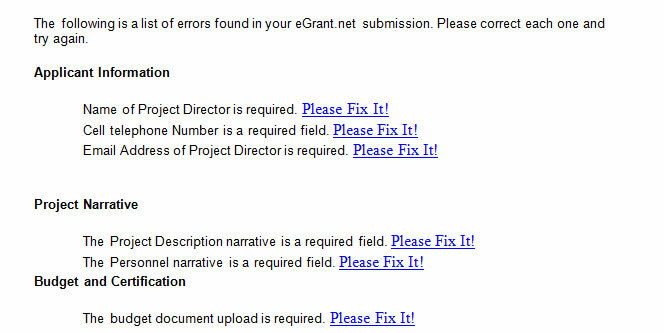 eGrant.net will not automatically save your work before proceeding to another page. You can stop working on a grant application at any point during the application process. Simply click the Save icon before you log out. You can also return and edit your application until it is submitted. Pasting from a word processing program into appropriate narrative fields will work, but formatting will be lost. Copying and pasting bullets, numbering, icons, images, etc. into the application fields will cause errors in the PDF version of the application. When you are satisfied with your application, click "Submit" on the left side of your screen. If you failed to fill in all mandatory fields, you will see a list of corrections that must be made prior to submission. Use the "Please Fix It" links to make revisions in appropriate areas. 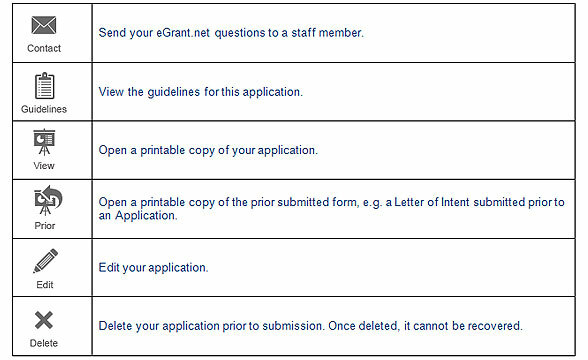 If eGrant.net considers your application to be complete, you will see the "Submit My Data" button. Click that button to submit your application for consideration. When you have completed the data entry in eGrant, click on the FINISH button located on the top, right menu of the eGrant system screen. The system will identify omissions to required fields and uploads. Click on the “PLEASE FIX IT” button for each item listed. This will take you directly to the omission that needs to be included, so that corrections can be made. It is important to note that the system will not recognize incorrect data or documents. Please read carefully. If you are unsure which attachments should be uploaded for the application you are submitting, please contact a program manager. To print a copy of the application before or after you have submitted it, return to the Main Menu and click the VIEW button for the appropriate application. Remember that the uploaded attachments such as the budget, grant history and activities documents were downloaded and saved to your computer and will not be a part of the printed PDF of the application form. To have a completed copy of your application with attachments, you will need to print those saved documents from your computer separately. We recommend that you view all uploads within the system using the directions under “Download and Upload” before hitting the final submit button to make sure you have attached the correct documents. The word “Draft” will appear on the PDF form if you have not clicked on the final submit button. If you are pleased with the data entry on the PDF, and are sure you have uploaded all the corrected required attachments, you are now ready to download the Certification Document located under the Budget & Certification Tab. Once you have downloaded the Certification Document onto your computer, open the document and print it out. The Certification Page (Section J) must be signed and mailed to the Council along with any other supporting documents within three days after the application due date. Finally, submit your application. Click the “Submit My Data” button located under the Finish Tab. Remember that once you click “Submit My Data” button, you will not be able to make any changes or adjustments to the application. Log onto the eGrant system using your login information. Go to the list of applications submitted. You will find the words “Final Report” under the funded applications. Go to the green EDIT button; click to open the Final Report Form. Follow the procedure you used for submitting the application. Make sure to also include your signed and notarized Actual Financial Report Form as well as your Invoice and Request for Payment for the final portion of your grant award. A final report is not complete without all three of these documents. Your final report should arrive within three days of electronic submission and is not considered complete until all information is received. The Alabama State Council on the Arts (ASCA) is pleased to award grants to nonprofit arts organizations, schools, universities, cities and a wide range of community groups. As a recipient of Alabama State Council on the Arts grants, we rely on you, the grantee, to help publicize the work these grants made possible. When you acknowledge ASCA in your publicity materials, citizens and elected officials learn why these funds are important to all Alabamians. To help elected officials understand what the investment of public funds for arts activities accomplishes, we strongly encourage you to contact your state senator and representative(s) and U.S. senator and members of Congress and invite them to your public program(s). And, we encourage you to write a letter thanking them and making them aware of the programs made possible by their support. Please send copies of invitations and letters to ASCA’s office. When no printed materials or programs are used, please give verbal credit to the Council prior to each event. Copies of logos can be downloaded by clicking here.